At first glance, the Hamdan Street showroom of Crystal House Lights & Gifts seems a most unlikely venue for a conversation about anything other than crystal, lights and gifts. Ornate mirrors, console tables, and light fittings line the walls, multicoloured crystal chandeliers hang low from the ceiling and tables are loaded with fine crockery, cutlery and delicate porcelain ornaments. The shop may be decked in silk, gilt, and glass, but it is also home to a historical resource just as rare and invaluable to students of Abu Dhabi’s history as any official document in the National Centre for Documentation and Research. That resource is Nasser Al Hajeb, the softly spoken, septuagenarian managing partner of Crystal House and an Abu Dhabi resident since 1968. What sets him apart is not only his remarkable career – he worked on the construction of Abu Dhabi’s first Corniche, Mina Zayed, the existing Presidential Palace, and the Sheikh Zayed Grand Mosque – but the fact that he has recorded it all meticulously in diaries, files, photographs and fading press clippings that line the walls of his office. The fabric of Mr Al Hajeb’s life in Abu Dhabi is the story of the city. Overnight, Mr Al Hajeb went from being an accountant with a Kuwaiti contracting company, Al Zamel & Darwish, to being their sole representative in Abu Dhabi. For a budding executive out to make a name and a new life for himself, Mr Al Hajeb’s beginnings were not auspicious. His first home was in a subdivided, single-storey, cinder-block building near the site of what is now the Hilton Corniche. Given its scarcity at the time, it is perhaps not surprising that many of Mr Al Hajeb’s early memories of life in Abu Dhabi involve the availability and quality of fresh food. Not long after his arrival, Mr Al Hajeb won his first major contract, to supply vehicles and excavators to the contractors building Abu Dhabi’s first Corniche. Another major contract soon followed when Al Zamel & Darwish was involved in the construction of the infrastructure for a new port, Mina Zayed. It was while Mr Al Hajeb was taking delivery of new vehicles that he had his first face-to-face meeting with Sheikh Zayed, an experience he would repeat several times, but one which he remembers vividly. Soon after, Mr Al Hajeb made a decision that would alter the course of his life. He left the construction industry and went into business with an Emirati partner selling lighting, chandeliers, luxury wallpaper, porcelain, crystal, and gifts. His timing was opportune as oil revenues were finally starting to manifest themselves in the construction of new government ministries, palaces, houses, and mosques. One of Mr Al Hajeb’s first public projects was supplying the lighting for what was then the new Sheikh Zayed bin Sultan Mosque on Airport Road, which still stands next to Etisalat headquarters. Little did he realise that 40 years later, he would also oversee the design and installation of all seven Swarovski crystal chandeliers in the Sheikh Zayed Grand Mosque. When the mosque opened, the centrepiece was reportedly the largest chandelier in the world. 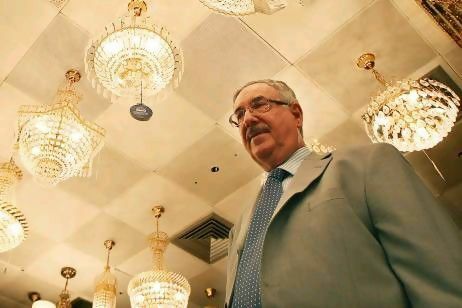 When Mr Al Hajeb’s involvement with the project began in 1994, he had already supplied the chandeliers for the Presidential Palace, but nothing could compare to the stamina and effort required for the Grand Mosque. Mr Al Hajeb and an engineer even stayed in the mosque overnight before its opening in time for Eid Al Fitr in 2007. The next morning, Sheikh Khalifa, President of the UAE, and 20,000 other worshippers came for prayers. Of all the projects Mr Al Hajeb has been involved with, his role in supplying the lighting for the Sheikh Zayed Grand Mosque is the work that makes him most proud. 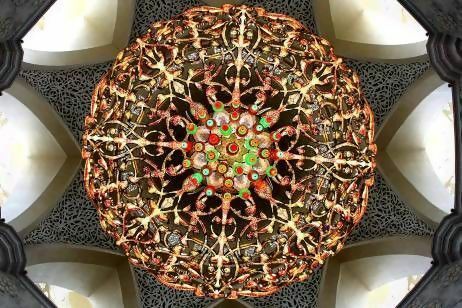 “When I see the photos now of people praying under the chandelier during Ramadan, I feel like I made something,” he said. At the age of 70 and after all he has seen – a family business established, a city transformed and a nation built – Mr Al Hajeb’s next project must be spectacular indeed.